It's funny how some professions embrace certain stereotypes about themselves. That journalists, for example. Anyone who has worked in journalism for any length of time (especially in print journalism) knows someone, or someone who knows someone, who fits the mold of the out-there and reliably crazy foreign reporter who nonetheless always manages to get great copy; there's the uncertain and awkward young reporter or intern, still try to figure out how they fit into the mess; the editor who has given up their personal life for the paper – really, as someone who works in journalism, I know that this list can go on and on. 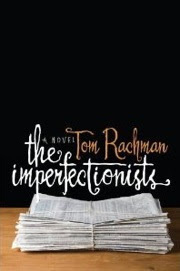 In his novel The Imperfectionists, Tom Rachman (also a journalists) writes about what he knows best: an international newspaper struggling to survive when the economy is in the tank. The fictional newspaper – as far as I can tell – is modeled after the International Herald Tribune and has its head offices in Rome. Rachman tells the paper's story through its employees: each chapter is told from a different perspective and each closes with a blip from the paper's history, starting with when and why it was founded and moving forward through various editors and explaining how it reached its contemporary predicament. Clearly, the paper made a few missteps. For example, in the novel's present day (2005), the newspaper has no website and thus no web-presence through which to grow its readers. But the novel is less about the woes of the newspaper industry – although those are certainly discussed – than it is about the lives of the people who devote themselves to the institution. Everyone from the long-time reader to the accounts person to the copy editor and the foreign correspondent are detailed. And the lives Rachman writes about, though funny, are in most cases also quite sad. There are few happy romantic relationships, few people who are truly satisfied with their jobs, and much discussion about food and drink. That isn't to say the novel is a downer, but it is a little sobering. But it is also very, very funny. The entire section on on Winston Cheung, the hapless wannabe journalist with no experience and a partially-completed graduate degree in primatology who goes to Cairo in an attempt to become a stringer, is hilarious. Really, it's comedy that should be performed in one long shot and no breaks if the book is ever adapted into a movie. Winston becomes totally overtaken by Rich Snyder, international journalist extraordinaire and total nut-job. Winston is overcome by the quick-talking, experienced Snyder and Rachman's scenes lead from one disaster to another with so much energy you can hardly flip the pages fast enough. It's a chapter that comes almost half-way through the novel, and it's a nice break from both Europe and the perspective of older, more experienced journalists (although they're nice to return to after the chaos in Cairo). In general, newspapers are institutions people are curious about. They're also difficult to portray on TV or in movies because, although they're fast-paced environments, there aren't huge, Pulitzer-worthy, breaking stories every day – that makes them good fodder for books. Rachman, having worked at both the International Herald-Tribune and the AP wire service, knows that. His novel takes place mostly outside of the newsroom, but manages to give a pretty good indication of what that life entails. Especially in the cyclical nature of it; although news is always changing, day in and day out the job itself tends to remain the same. Rachman plays with the clichés of both newspapers and ex-patriots and, even in their extremes, all the characters ring true. The little details of their lives that Rachman slides into his descriptions and dialogue build real lives out of archetypes and make his characters seem familiar – rather the way we feel about columnists whose work we read regularly. It's that treatment – understanding that although newspapers are about news, they're also about people and the building they're put together in and the culture that surrounds them – that makes this a great novel for both the people who make newspapers and those who read them. The only thing it's missing is the inky smell and crinkly pages.